Side effects associated with Amoxicillin (Amoxil) are typically mild and include nausea, dizziness and diarrhea. Some instances of diarrhea on this medication may also be linked to more severe side effects, so you should let your healthcare provider know if you are experiencing any problems on Amoxicillin or Amoxicillin based medications. Taken in moderation for infections, this is a very effective treatment. However, using Amoxicillin frequently can decrease its overall effectiveness. Be sure to let your doctor know if you have taken amoxicillin medications before. If the above side effects persist, worsen or seriously disrupt your everyday life, you should contact your doctor. Do not take anti-diarrheal medication while taking Amoxicillin. Diarrhea that is watery or bloody is of a particular concern and should be brought the attention of your doctor. Always tell your doctor if you choose to stop taking Amoxil or amoxicillin as your infection may still need to be treated. One of the common side effects of amoxicillin effects is reduced effectiveness of birth control medications. If you are relying solely on a birth control pill, ring or patch to prevent pregnancy, you should talk to your doctor. You may need to use a secondary method of birth control, such as condoms, until you have completed your Amoxicillin regimen. One of the more common amoxicillin side effects is a rash. Since it is difficult to distinguish a harmless rash from one indicative of an allergic reaction, you should see your doctor if any type of rash develops. Patients with mononucleosis (mono) are more likely to develop a rash. It is generally recommended that individuals with mono avoid taking amoxicillin medications. Prolonged or repeated use of amoxicillin can cause a vaginal yeast infection or yeast infection of the mouth. Amoxicillin does not discriminate between good and bad bacteria. When the beneficial bacteria in the body are killed off, it is common for a yeast infection to occur. If you experience either of these Amoxil side effects, you should contact your heathcare provider. 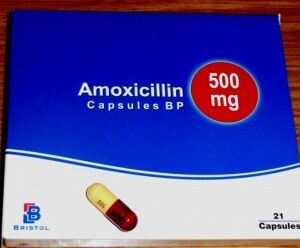 Amoxicillin are time-tested antibacterial medications that are safe for most patients. Always complete your entire dosage to reap the full effects of these drugs. If you experience adverse side effects, consult your doctor to discuss your options. Stopping Amoxicillin early could result in a relapse of your original infection.